Today I am so excited to be able to share this gorgeous stamp set called Dream Catcher with you. 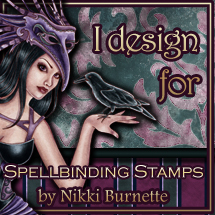 This is one of the many fun new stamp sets for 2016 at Dare 2B Artzy. This set features 9 stamps total, two of which are sentiment stamps. You will not believe the amazing detail of this stamp set! You will just have to get your hands on one and start playing so you can see the detail for yourself. To create my card today, I stamped the dreamcatcher centerpiece twice using embossing ink and heat embossed it with a Champagne colored embossing powder. Next, I used three metallic gelatos in teal, blue and purple and added color to the center medallion on one of my embossed images and on the other I added some gelato color using a paper stump on just the outer edge of the dream catcher and the little circles. Once my color was added I burnished the color around with my finger to make sure all the white areas were covered. I added a tiny bit of water to the areas I’d colored and blended the colors a bit until I was happy with how it looked. I carefully blotted them dry so as not to smudge the colors too much. I fussy cut both the center medallion and the whole dreamcatcher and layered the center medallion onto the larger dreamcatcher for a dimensional feel. I used the same technique on the feathers, stamping two each of the larger feathers and one of the small feathers. After I’d added my color and blended with water, I used the die set that’s also available for the feathers in this stamp set so I wouldn’t have to do any fussy cutting – yay! Of course the dies cut the feathers perfectly. For my background I embossed a piece of white cardstock with a feather embossing folder that I thought coordinated nicely. I layered that onto some of my shimmery light gray cardstock for my card base. I positioned my dreamcatcher and feathers onto the embossed cardstock and secured them in place using some dimensional foam. Finally I stamped the sentiment, “To Catch your Dream you have to Chase it” using some embossing ink on white cardstock and heat embossed it with the same Champagne embossing powder. I am thrilled with the way this card turned out. The Dreamcatcher stamp set is so fun and versatile. I know I’ll need to add the other coordinating stamp set Dream Big to my must have stamps. Thanks for stopping by! Be sure to follow me and the Dare 2B Artzy blog for more amazing inspiration from the rest of the design team! This is beautiful! Love the colors, the detail, the embossing…all of it! Thank you! These stamps are very detailed. Makes for beautiful images on cards. Really beautiful. I love the elegant colors. The design is super clever.